Graphical representation of a CChemEqElement. This correspondents to the sbml SpeciesReferenceGlyph. The copasi equivalent is the CChemEqElement, however it has no key, so it cannot be referred to. Definition at line 141 of file CLReactionGlyph.h. Definition at line 150 of file CLReactionGlyph.h. Definition at line 256 of file CLReactionGlyph.cpp. Definition at line 263 of file CLReactionGlyph.cpp. Definition at line 270 of file CLReactionGlyph.cpp. References CLGlyphWithCurve::mCurve, mMetabGlyphKey, and CLGraphicalObject::setModelObjectKey(). Definition at line 212 of file CLReactionGlyph.h. 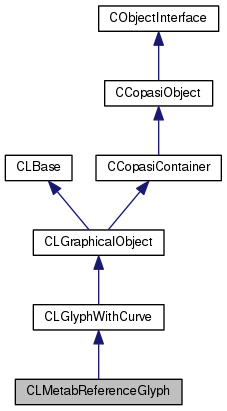 This method writes the information of the COPASI layout object into the corresponding SBML object layoutmap contains a map from COPASI layout objects to libsbml layout objects. this is needed for resolving the reference to the metab glyph. Definition at line 323 of file CLReactionGlyph.cpp. References CLGraphicalObject::exportToSBML(), CLCurve::exportToSBML(), getMetabGlyph(), CLGlyphWithCurve::mCurve, and mRole. Definition at line 317 of file CLReactionGlyph.cpp. References CKeyFactory::get(), CCopasiRootContainer::getKeyFactory(), and mMetabGlyphKey. Referenced by exportToSBML(), CCopasiSpringLayout::finalizeState(), operator<<(), CCopasiSpringLayout::potEdge(), and CCopasiSpringLayout::potSecondOrderEdge(). Definition at line 202 of file CLReactionGlyph.h. Referenced by CLayout::CLayout(), CLayout::exportToDotFile(), CCopasiXML::saveLayoutList(), and CLLayoutRenderer::update_associations(). Definition at line 206 of file CLReactionGlyph.h. Referenced by CLayout::exportToDotFile(), CCopasiSpringLayout::finalizeState(), operator<<(), CCopasiSpringLayout::potEdge(), CLRenderResolver::resolveStyle(), and CCopasiXML::saveLayoutList(). Definition at line 209 of file CLReactionGlyph.h. Definition at line 304 of file CLReactionGlyph.cpp. References mMetabGlyphKey, mRole, and CLGlyphWithCurve::operator=(). Definition at line 379 of file CLReactionGlyph.cpp. Definition at line 204 of file CLReactionGlyph.h. Referenced by CLayout::CLayout(), CCopasiSpringLayout::createLayout(), CLayoutInitializer::createReactionGlyph(), and CCopasiXMLParser::MetaboliteReferenceGlyphElement::start(). Definition at line 207 of file CLReactionGlyph.h. Referenced by CCopasiSpringLayout::createLayout(), CLayoutInitializer::createReactionGlyph(), and CCopasiXMLParser::MetaboliteReferenceGlyphElement::start(). Definition at line 178 of file CLReactionGlyph.h. Referenced by CLMetabReferenceGlyph(), getMetabGlyph(), getMetabGlyphKey(), operator=(), and setMetabGlyphKey(). Definition at line 180 of file CLReactionGlyph.h. Referenced by exportToSBML(), getRole(), getRoleDisplayName(), operator=(), and setRole(). Definition at line 166 of file CLReactionGlyph.h. Definition at line 172 of file CLReactionGlyph.h. Referenced by CCopasiXML::saveLayoutList(), and CCopasiXMLParser::MetaboliteReferenceGlyphElement::start().